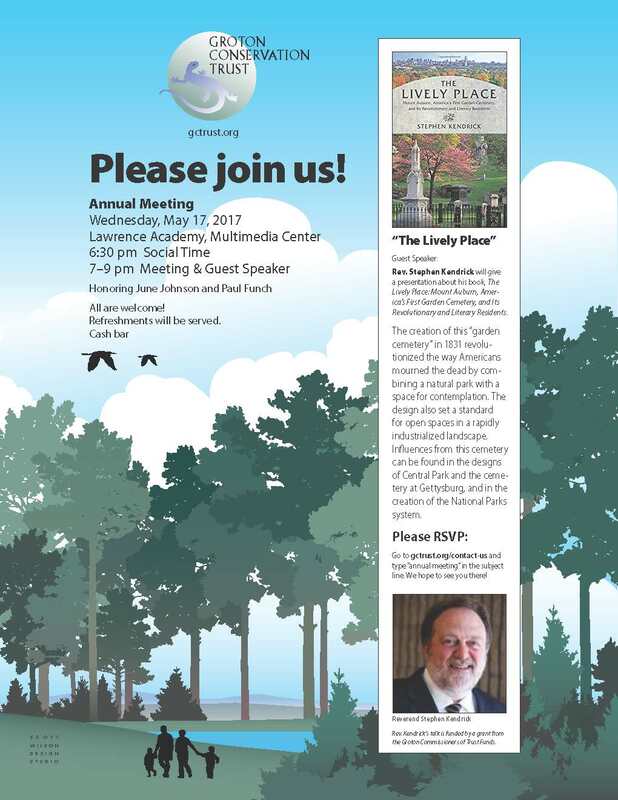 Please join us for our annual meeting. We are delighted to honor two very special people with GCT awards. The first is long time trustee June Johnson with our honorary trustee designation. The second is trail friend Paul Funch with the Groton Conservation Award. In addition, we are thrilled to have Stephen Kendrick speak about his book, “The Lively Place” about Mount Auburn Cemetery. He will have copies of his book to sign for you as well. We will also have refreshments and an update of the GCT year, so please join us. Parking for the Media Center on the LA campus is available at the end of the new 119 entrance, and in the First Parish Church lot. For handicap accessibility, please drive right up to the building on Powderhouse Road. Reverend Kendrick’s talk is made possible by a grant from the Groton Commissioners of Trust Funds.